Here’s a pre-Thanksgiving Day meal complete with primo, secondo and contorno. I was most excited about the contorno and had been squirreling away supplies from the dining facility for some time for it. 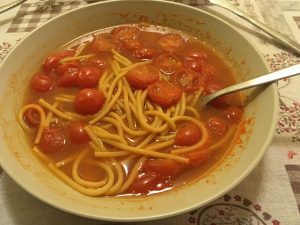 The primo, a dish more suited to Italy’s hot summers, came out surprisingly well, and the primo, a simple soup, rounded it out. 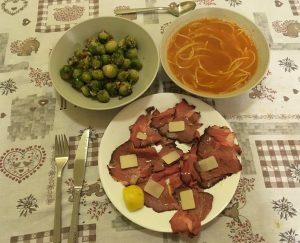 I liked this meal so much I had it twice yesterday — or was it just that I had leftovers and it was easy to allungare the soup a bit? One or the other, let’s say. This one was made easy by Better than Bouillon lobster base. Of course the actual recipe from Trapani calls for catching one’s own lobster and then making decorative use of the claw, but here there’s that whole piddly detail of being 1400 km from the nearest port. Simply boil water, add a tablespoon of the base, break some spaghetti up and toss it in (correct that breaking is never done, but this is a soup). I added a garlic clove and for the dinner version several cherry tomatoes. You can also put in a spot of tomato paste, or, since I didn’t have that, some tomato passata. Also very easy and made possible by the rare (pun intended) appearance of roast beef at the local sandwich bar. Spread out and arrange the slices, dress with juice of a fresh quarter lemon, good EVOO, S&P, and thin slices of a grana-type cheese (I used grana padano). Cherry tomatoes are a nice addition; arugula usually works wonders, but the dining facility had run out mere seconds before. 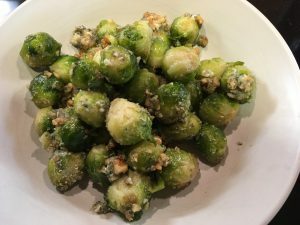 I found this recipe when researching how to to do a perfect pasta with gorgonzola and walnuts, and it makes use of both to liven up the kiddie favorite of Brussels sprouts. This required a bit (but not too much prep). There is absolutely no gorgonzola here, so bleu cheese crumbles have to work. I swiped a roll from the salad bar awhile back, let it go stale, and then it nicely crumbled into fine dustings of bread crumbs. By some miracle, one of the few non-depleted stocks at the Italian PX is butter from Udine. They have gobs of it. Prep the above, boil your sprouts, and drain them. As you’re transferring them into Pyrex, clarify the butter in the still-hot pot you boiled them in. 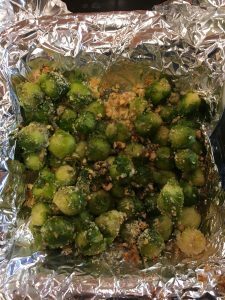 Combine the breadcrumbs, cheese, nuts and clarified butter with the sprouts, give them a twist with a spoon to distribute the toppings, and bake for 10 minutes. Eccola! There’s a pre-Thanksgiving feast worthy of the birthday of the prophet, peace be upon him. 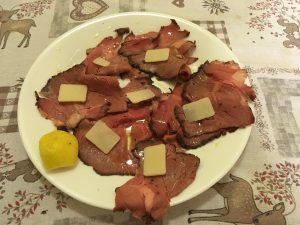 This entry was posted in food, italy and tagged cucina italiana, cucina siciliana, italian food. Bookmark the permalink.